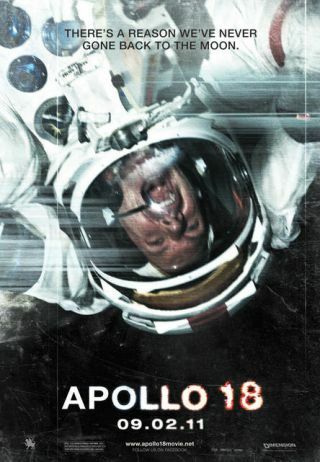 Apologies to anyone whose bubble will burst, but "Apollo 18," the film opening Friday (Sept. 2), is fictional. The film, purporting to be produced from footage kept secret by NASA and leaked to the media, chronicles a NASA mission to the moon that went awry when astronauts encountered signs of alien life there. "Decades-old found footage from NASA's abandoned Apollo 18 mission, where two American astronauts were sent on a secret expedition, reveals the reason the U.S. has never returned to the moon," reads the movie's official tagline. The studio has been pushing the "reality" aspect of the film, going so far as to offer up a "famous scientist and researcher of UFO phenomena," Stanton Friedman, for interviews. "People ask why was there no Apollo 18 mission," Friedman said in press materials. "I ask, what happened to Apollo 18 and Apollo 19? They were both paid for and astronauts were trained. What happened to these missions?" Friedman hasn't been allowed to view the film yet, according to the Los Angeles Times, but said he's open to the possibility that the Apollo 18 mission did occur and that NASA's been covering it up. "One of the things the secret keepers take advantage of is ego," Friedman told the L.A. Times. "I'm not saying that this footage exists. I'm saying it's possible that there's a whole classified side to this and that it would make sense. I allow for that possibility." For its part, NASA said it trusts most members of the public to recognize the movie for what it is. "It's obviously a film for entertainment, and the fact that they're using a mockumentary style in the production is just part of the marketing," said Bob Jacobs, the space agency's deputy for communications. NASA provided the producers with public domain footage from the actual moon missions and even allowed them to use its official "meatball" logo on the actors' spacesuits. But the space agency said it had no formal involvement in the film. Initially, NASA officials didn't realize the moviemakers planned to portray the story as a real-life exposé. "We were always under the impression it was fictional — it was basically never touted as anything but fictional," said Bert Ulrich, NASA's liaison for multimedia, film and television collaborations. "After we learned about it, the script went through a couple rewrites, they did reshoots. The final project wasn’t exactly what we thought it was going in. It had a 'Blair Witch' feel to it." "The Blair Witch Project," a 1999 horror film that made famous the "found footage" genre, convinced many viewers that it was compiled from genuine amateur film footage. The conceit added to the scary factor and helped the film gross more than $248 million worldwide. "Apollo 18" isn't the first suggestion that America's manned moon missions did not go as planned. Ever since the first lunar landing in 1969, some have insisted the moon achievement was a hoax. "There are a handful of stories that are cyclical, and among them are the moon conspiracy theorists," Jacobs told SPACE.com. "It seems that no matter what you produce, they just don't believe it. We have all these new images, for example, from LRO [NASA's Lunar Reconnaissance Orbiter] that show the landing site. But conspiracy theorists think that somehow we've doctored the photos on the lunar surface." In choosing how to respond to the "Apollo 18" marketing campaign, NASA was wary of severing a relationship with the filmmakers. "We were hesitant to back out because of concerns that that would feed into the marketing of conspiracy theorists," Jacobs said. "We were in a difficult situation." Ultimately, while most moviegoers may not believe "Apollo 18" is real, they may still find that its true-life style and "What if?" storyline ratchet up the tension for a thrilling ride.